The “Generation 6” cars that race on the high-banked ovals of NASCAR’s short tracks have brakes. 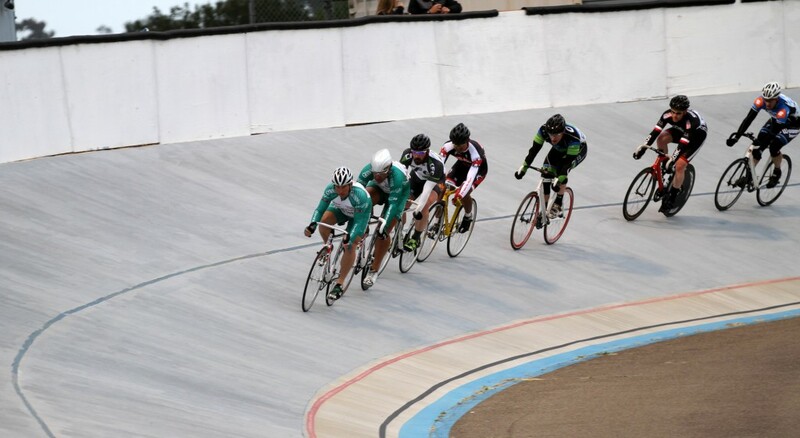 The bicycles that race on the high-banked track of the San Diego Velodrome do not. NASCAR vehicles have a complex transmission. Track bikes have a single fixed gear. And while track bikes will never put out the 450 to 850 horsepower of a Gen 6 car at Bristol Motor Speedway, with current and former world champions racing at the San Diego Velodrome the differences can seem to fade: A lot of “engine” power in close quarters makes for exciting racing. The crowd at Tuesday Night Racing is one part Gathering of the Tribe of the Fixie Hipster Nation, one part Friends & Family, with a lot of cycling enthusiasts thrown in for good measure. Gary Westergren, the track’s PA announcer (himself a former Velodrome racer), said, “the Downtown bike messengers get off work on a Tuesday night, and where else are they going to go?” At another level, Westergren said, the top racers on a Tuesday night are a sort of Platonic ideal of the bike messengers’ self-image. From a purely spectator-sport standpoint, the quality of the racing itself justifies a trip to the Velodrome. “A” races regularly feature multiple riders with jerseys fringed in the rainbow stripes reserved for former world champions. From time to time, the races feature current professionals and reigning Olympic medalists. Indeed, one current professional is suing the city and the San Diego Velodrome Associates because he was injured in a crash during a race on the track. “The atmosphere is casual,” Westergren told me, as he put a Maroon 5 song on the track’s sound system. “This one’s for Chris Michaels,” he said to the crowd. Michaels, a regular Velodrome racer, and his handlebar moustache gave Westergren a scowl. The best of the night’s racing was the Madison event: the undisputed king of track bicycle racing. If track racing is NASCAR on bikes, the Madison is tag-team wrestling on an oval track. It is, at the most basic level, a team Points Race in which teams of two riders compete for as many as 200 laps. One rider from each team is “active,” racing toward the bottom ring of the track with the “reserve” rider circling higher. The tag occurs when the active rider literally and physically throws his teammate into action with a “slingshot” motion. A team wins by either gaining laps on the field or by accumulating the most points in the sprints occurring every five laps. It’s dramatic. It’s epic. There’s copious opportunity for mayhem, and the resulting nonstop action is an improvised two-wheeled competitive dance of brilliance. That’s a finish that would have made NASCAR proud—and it’s what keeps bringing spectators to the Velodrome on summer Tuesday nights.